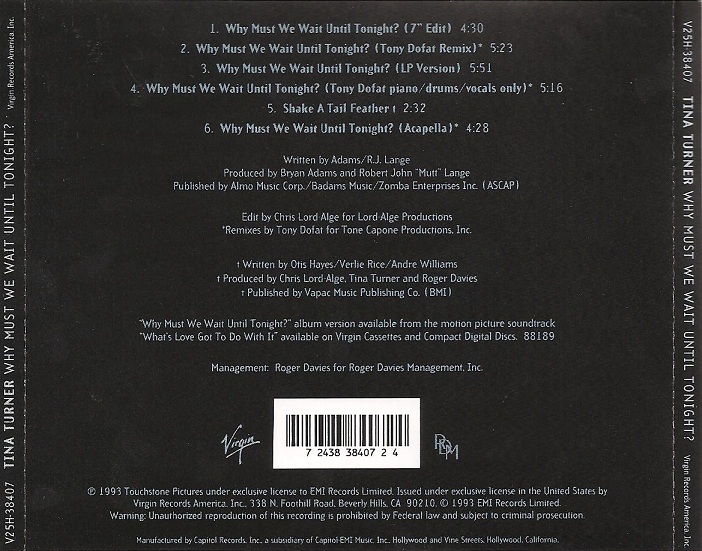 Below, you will find three remixes of Why Must We Wait Until Tonight?, taken from the 1993 US 6-track CD-single. Particularly nice is the acapella version. Other tracks on this single are the LP and single versions of this song, as well as Shake A Tail Feather, all available on the 1993 What’s Love Got To Do With It? soundtrack album. Enjoy! EXCELENTE TRABAJO!!! EL AUDIO ES MUY BUENO. LA VOZ SUBLIME!!! GRACIAS POR COMPARTIRLO!!! Thank you. My favorite Tina song ever. I love the artwork for the sing, so fresh and elegant. Tina is my simply the best. I love the acapella version. In my opinion, the synth components on the album version made the song sound overproduced. The drum/piano/vocal mix demonstrates how great this song could have been. Does anyone know where I can get a copy of this cd? I leant my original to a friend and never got it back. Ben, Thank’ s so muth for sounds. In special the lyrics it’s so fine. We can feeling the strong Tina’s Energie . i love you dear Tina Turner. Plesse come to some shows in Switzerland Ende Brasil to. You’ re allways the best . Best then one the habe. Big hug Tina turner.